This clean 2005 Regal 2400 bowrider is the perfect fit for a large family or a group of friends. The huge bow area give you the room of a deck boat but the Regal Fas Trac hull gives you the performance, handling and efficiency of a sport boat. 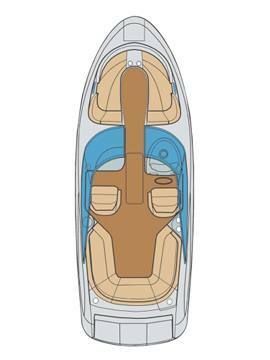 This boat is perfect for the inter-coastal . Trailer included and powered with a 5.0 GXI volvo penta duo-prop. Advancing the art and science of bowrider design to new heights, the 2400 quickly charges ahead of the pack with class-winning FasTrac performance. Beyond speed, and the quiet ride, you are moved as well, by extraordinary style and luxurious amenities. A built in refreshment center, bow and stern boarding ladders, enclosed head compartment, deep comfortable U-shaped seating for six and innovative standard features at every turn, considerably raise the stakes for all other 24s wishing to compete. Merc 350 MAG MPI - 300 hp. Merc 496 MAG MPI - 375 hp. Merc 5.0L MPI - 260 hp. Volvo 5.0 Gxi - 270 hp. Volvo 5.7 Gi - 280 hp. Volvo 5.7 GXi - 320 hp. Volvo 5.7 OSi - 280 hp. Volvo 8.1 Gi - 375 hp. Volvo Diesel D3 XDP - 163 hp.